MPCNC Acrylic enclosure Hinge and Foot by Thbreidenbach is licensed under the Creative Commons - Attribution license. This is part of an enclosure for my Mostly printed CNC. The purpose of the hinge and foot pieces is to hold a 5mm acrylic sheet between the conduit and build plate. Two hinges go on each side next to each mpcnc foot, its up to you how many foot pieces you use. 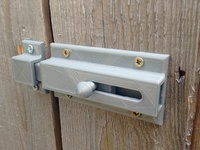 Each hinge is 4cm wide so they shouldn‘t interfere with endstop mounts. I plan to include mounts in a future revision. I just printed the hinge and it works smoothly. You should rotate the hinge to avoid the need for support! I designed it to open to a certain degree so it doesnt fall off the conduit when unscrewed but still fits onto the conduit. 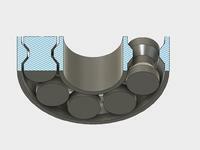 The Design is for 25mm conduit and M4 Screws/Nuts. Might work for 25.4 too, if someone could report that‘d be nice. 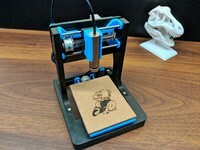 Say thanks by giving Thbreidenbach a tip and help them continue to share amazing Things with the Thingiverse community. We're sure Thbreidenbach would love a Tip, but unfortunately they have not setup their accounts to receive them yet.